Some people know me as someone who always makes fancy, complicated dishes, and I'll admit that I do make things like that sometimes, but the majority of the time I end up making simple dishes- simple, but yummy, that is, because I really don't enjoy eating food that doesn't taste good. 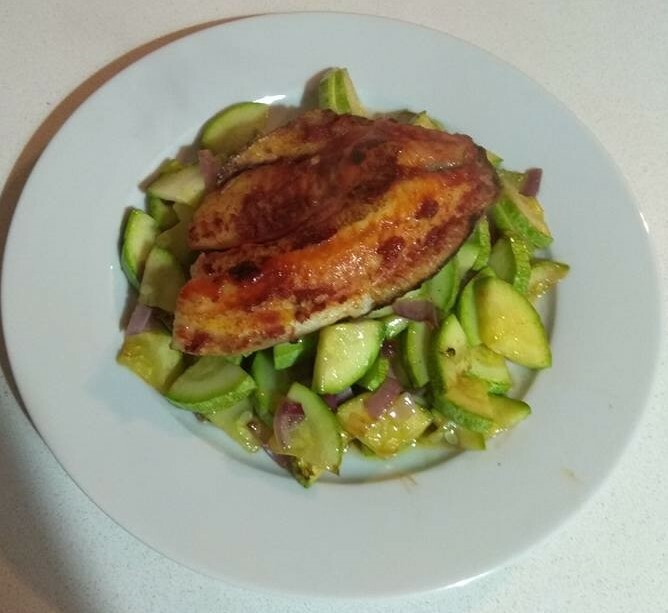 As someone who tries to stick to a Paleo diet, but can't eat eggs, and tries to do this as frugally as possible, I tend to buy a lot of white fish, generally St. Peter's Fish (a type of tilapia), but also a decent amount of flounder, sole, and turbot, etc... What they all have in common is that I buy them as fillets with the skin on, and I can also generally buy them for anywhere from $2-$3.50 per pound, and as each fillet is around 100 grams, so they work out to 20-35 cents per fillet, which is a very good price for animal protein. 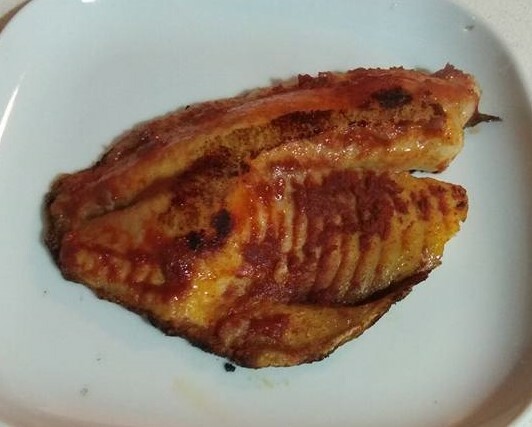 The other reason I like making this type of fish is that they're usually sold locally individually wrapped, or if not, frozen separately and then packaged together, so it is easy for me to remove enough fillets for a meal as necessary, and then quickly defrost them by soaking them in water. My average meal tends to be a fillet of fish served with veggies (generally sauted veggies, but sometimes a salad), and because of the frequency in which I make it, I've figured out the way to make it perfect- crispy on the bottom, soft on top, flavorful, and super easy to make. 1. Rub the flesh side of the fish fillet with spices if using, and salt (liberally, in my opinion). 2. Heat up oil until very hot in a non stick frying pan or skillet, on a medium/high flame. If you have cast iron, this is my favorite way to cook it, but if not, use another type of non stick frying pan. 3. 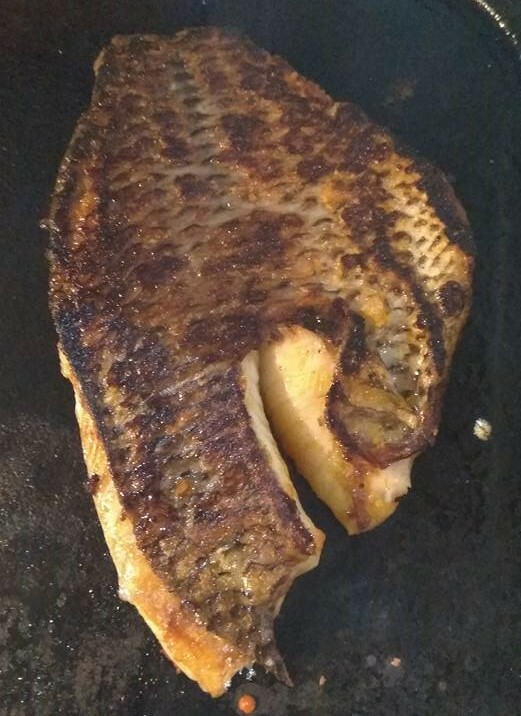 Once the oil is hot, place the fish in it, skin side down. It is very important to not move the fish once it is in the oil or the skin won't be as good, and it's texture will be problematic. So if you're making a few fish at once, figure out in your head first where each will go, and don't move them at all once they're in the pan. 4. Now the next part is to just leave it. It needs to almost fully cook without you touching it. It might seem tempting to play around with it, because maybe it'll burn, but just trust me, leave it. 5. Keep cooking it until the fish fully changes color, from more translucent to white. It makes it more complicated when you've got the fish covered in paprika like I did when taking these photos, but if you look closely you can see. Also keep an eye on the edges of the fish. If you look closely, you'll be able to see the skin getting crispy and pulling up, away from the bottom of the pan. 6. When nearly fully cooked, and just a tiny drop in the thickest area uncooked, carefully slide your spatula under the fish, and flip it over to cook on the other side for about a minute. You should be able to see the crispy fish skin in one solid piece when you turn it over like this. 7. Remove from pan and serve. Eat immediately. What is your favorite type of fish to eat and make? What is your favorite way to make it? Does this look like a recipe/technique you'd try? I have got to try this, have never been able to fry fish successfully. Thanks! Looks good! Going to try it, thank you! Could I do it with a whole fish?